Thank you filmzeitkaufbeuren for the wonderful premiere and an amazing audience! We had a great time at the festival and an interesting Q&A session. 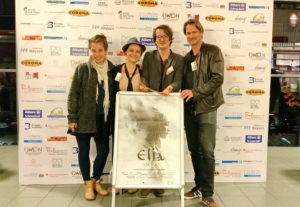 From left to right: Theresa Bacza (Producer), Claudia Hector (1st AC), Willi Kubica (Director), Matthias Kostya (“Emeram”). Previous Post Finally: Our Poster! Next Post International Premiere in Utah!